Experience comfort like never before. Laze in the lap of luxury. Where beauty lies under the skies. Shine in the perfect shade. VETRA has been an integral part of the furniture industry since 1990. In 2008, when cane furniture was in great demand, we introduced our Wicker collection. We are the first to create all outdoor furniture and accessories. We have our manufacturing unit, studio and head office based in New Delhi, India. 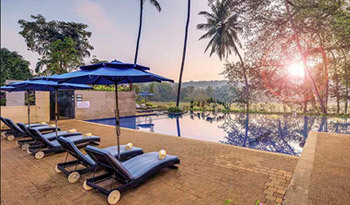 VETRA furniture is a potential supplier of wicker furniture, hotel furniture, resort furniture, patio furniture, outdoor furniture, garden furniture, poolside furniture, poolside umbrella and many more. Our dealers are available all over India and we will soon spread our hands overseas as well. We design and fabricate dining sets, sofas, benches, stools, planters, umbrellas and sun loungers focusing on the new trend. All these beautiful designs are created just to make sure that you enjoy your outdoor space in style. Our creations are made of synthetic fiber which is recyclable. The innovative designs made by us, be it the rusty look of hand-woven wicker or the natural look of wood, all are loved by the patio enthusiasts. We make sturdy and strong products that will not only suit your design aesthetic, but will last for years to come. Our collection has a transformative quality of renovating an old and boring space into an inviting and relaxing retreat. Our clientele includes all the leading corporate, hotels, resorts and clubs worldwide. We have an excellent and everlasting relationship with all our clients because of our promising after-sales service. Come enhance your lawn, balcony, garden, terrace or poolside with our customized furniture range and we will make sure to convert your outdoor space into a paradise of complete bliss. At Vetra, we make everything to enhance your experience of a perfect outdoor dining by offering a vast range of styles and size. From a frolic garden to a spacious patio, Vetra aims to perk the balconies of each home with swaggy outdoor furniture for a perfect breakfast. Experience delicious food on a gamut full of garden and balcony furniture, right here, right now for every kind of space. 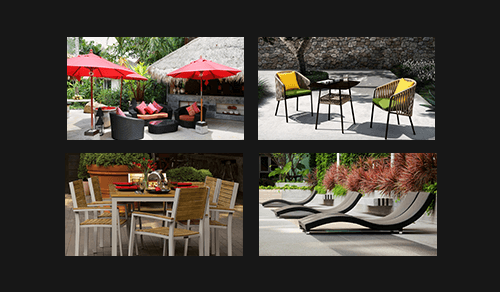 Manufacturer of stylish and sturdy range of furniture, Vetra supplies ingeniously designed outdoor living furniture range to create your own space of comfort. 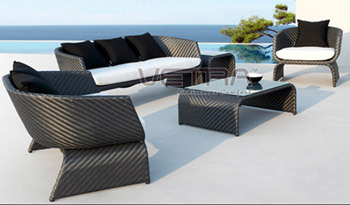 Shop at Vetra, to buy balcony dining sets, deck chairs, swigs, tea tables, etc., at an affordable price! 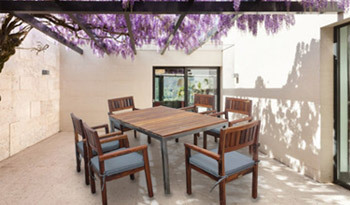 Browse our wide range of patio furniture made up of exceptional quality of wood and plastic at an affordable price. Patio or balcony is a place where a person looks for solace. 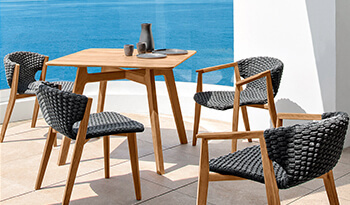 Vetra, manufacturer and supplier of world class patio furniture, helps you to experience comfort and peace right at your own space either with a cup of coffee or just a silent conversation with your companion. Hence, Vetra takes the responsibility to assist you in making it better in every possible way to offer the comfort you seek and forget what the clock counts. So, pick your choice now. 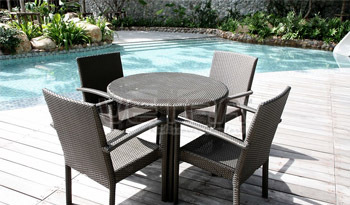 Wicker furniture is designed with high-quality cane-like materials, which includes rattan, bamboo, willow, and reed. Although, it is not a material but, a technique used to weave the material in transforming the outlook of furniture. Our world-class range offers everything you need to satisfy your craving for home décor. No matter what size or style you prefer, comfort is the sole key in designing of any furniture. To give the furniture a contemporary look, the meshy fabric is stretched around the frames made up of wood or metal. Online shopping for furniture is now made easy by providing exclusive designs and great values. Manufacturer and supplier of garden furniture Vetra, offers captivating garden chair set to add a style statement to your garden area. You can also customize the look of your garden area with our marvelous and affordable range of coffee tables and foldable chairs available in various frames. The furniture in this range offer seats contoured to provide an ideal and comfortable experience. Metal and wood framed tables made from top-notch, weather-resistant material are compact, and portable having a long life. Indulge in your deep thoughts and experience the freshness of air by resting on a deep-seated armchair. Shop now! If you are choosing a new abode or in search of adding new exclusive furniture to your collection, Vetra is a one-stop online store for all kinds of furniture. It has always managed in manufacturing and selling idiosyncratic masterpieces reflecting style, extravagance, and comfort. Be it well-crafted sofa sets, bed set, coffee table, or a dining table, it is our priority to transform your home into an aesthetic ambience. In this demanding era, we offer an impressive and satisfying selection of furniture to suit the requirement of modern to minimalist consumers. Shop with Vetra for the best quality of furniture at best price! M.G. Road, New Delhi- 110030.